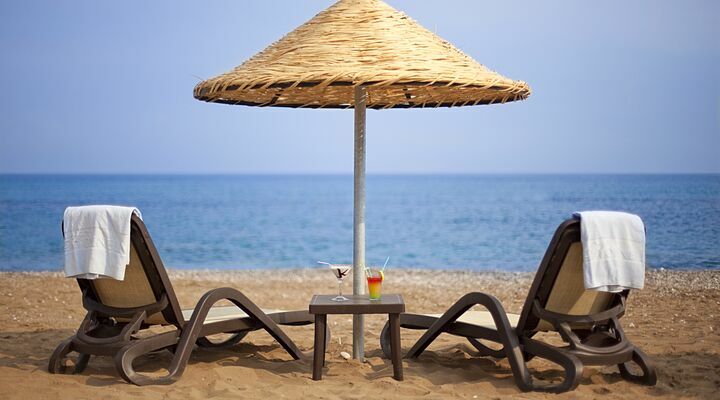 7 Nights from £519 inc Flights, Hotel & VIP Transfers - £223 OFF! 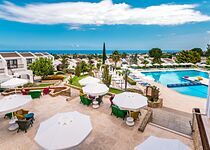 Korineum Golf Resort Hotel is literally just a chip shot from the international 18-hole golf course at the Korineum Club, set above the coast and with lovely views down to the sea. 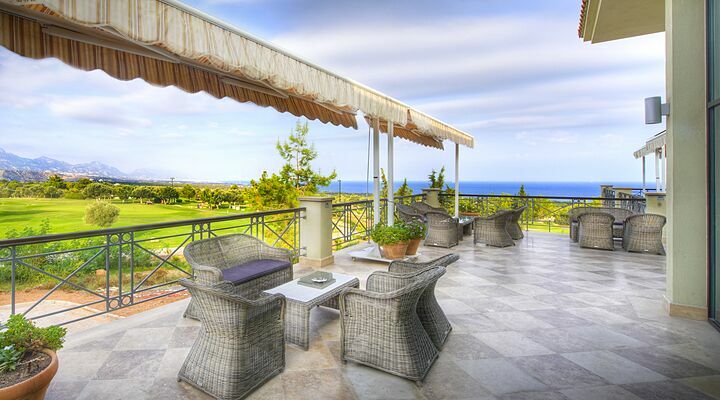 Golf fans can enjoy luxury accommodation and world-class golf, while their families can enjoy the swimming pool, private sandy beach, the spa and the excellent restaurant! 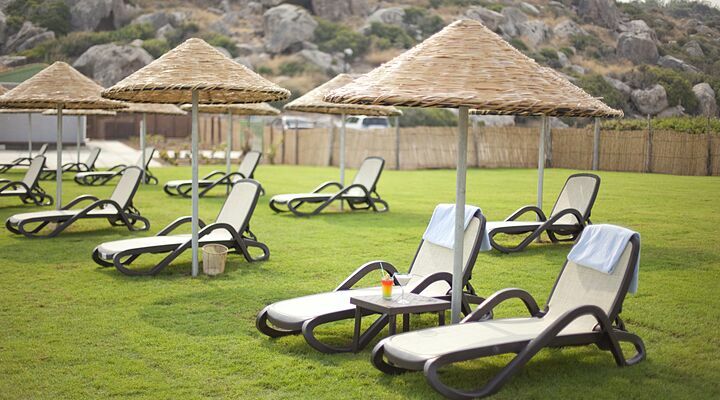 If you're looking for a great hotel with a golf course nearby in North Cyprus, why not stay right next to one! 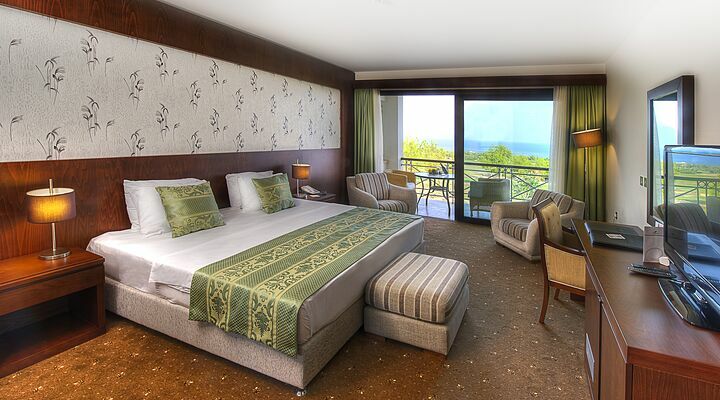 At the Korineun Golf Resort Hotel, you and your family can stay in spacious apartment style rooms with easy access to a swimming pool, a spa, a private beach, restaurants, bars - and the international standard 18 hole golf course. 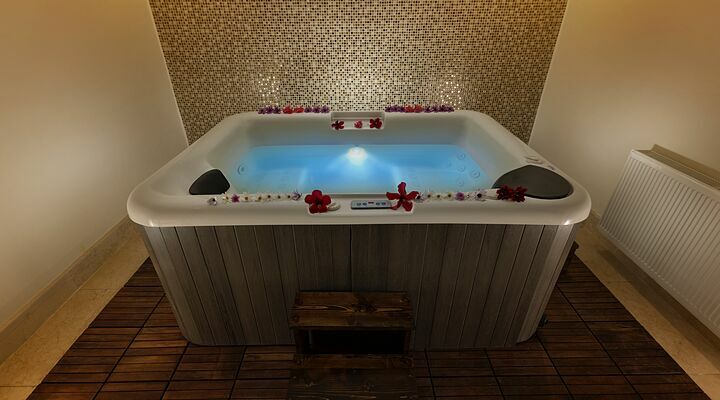 Located on a hillside with lovely views down to the sea, the Korineum is a peaceful, tranquil place to enjoy time on the tees and time with the family too. 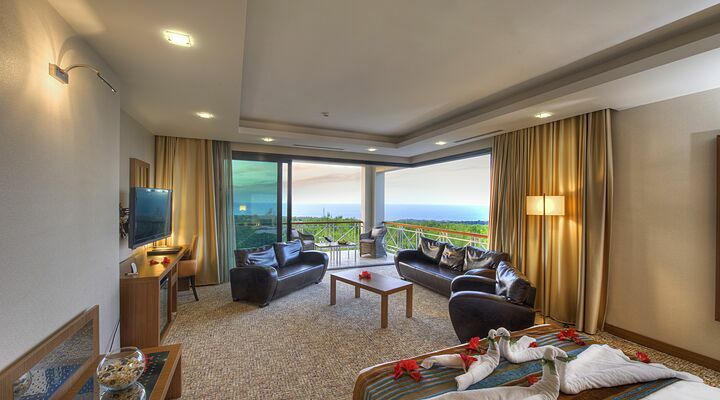 It's a sign of how popular this North Cyprus golf hotel has become that the original 46 room hotel was expanded to include more of the light, airy spacious rooms golfers and their families enjoy. 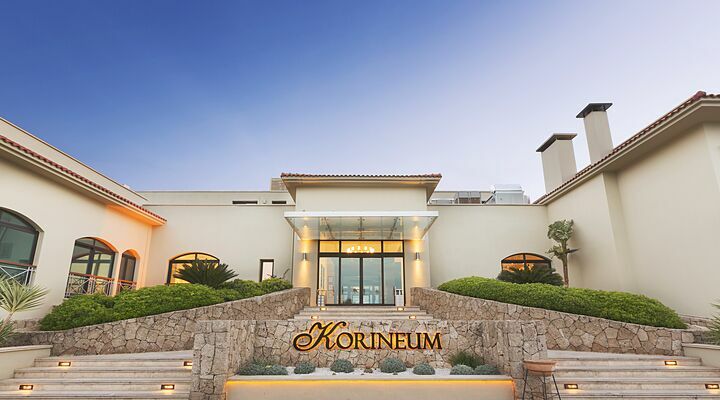 The Korineum Residence rooms are just the shortest of strolls from the Clubhouse and golf course, and the newer Korineum Elite rooms are just next door. 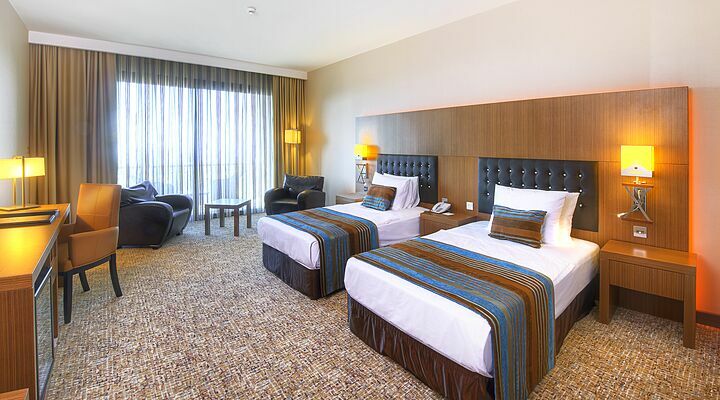 Every room has a balcony so you can soak up the views, with large en-suite bathrooms, air conditioning, satellite TV, a safety deposit box, mini bar, and free high speed wifi, so you can brag about your round score to all your golfing friends back home via social media! 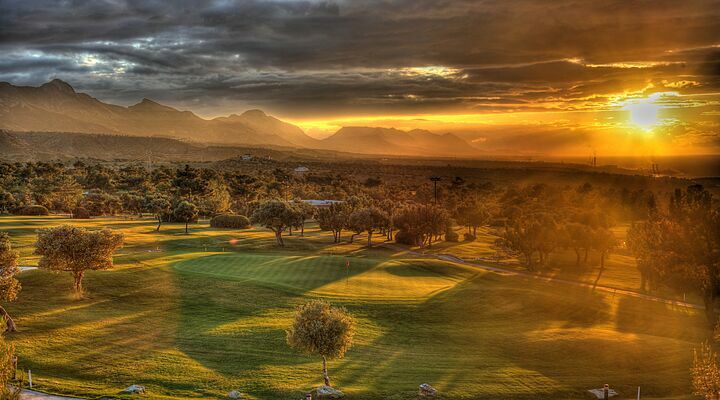 Book your next golf holiday with confidence from Go North Cyprus. 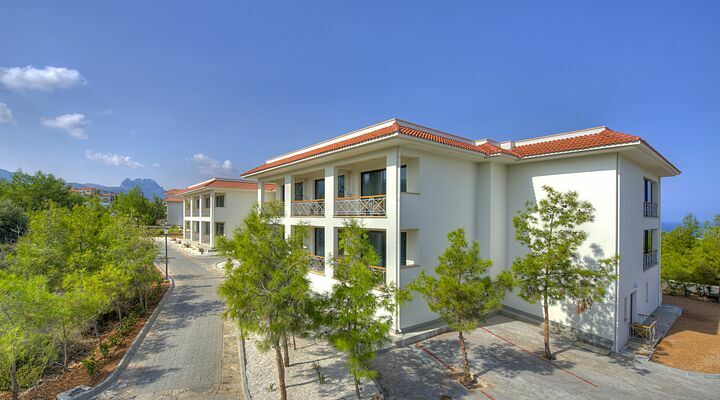 Our English Speaking team is based here in Northern Cyprus, and our MD plays too, so we're definitely up to par! Call us for tee times and prices - 0800 616 6600. 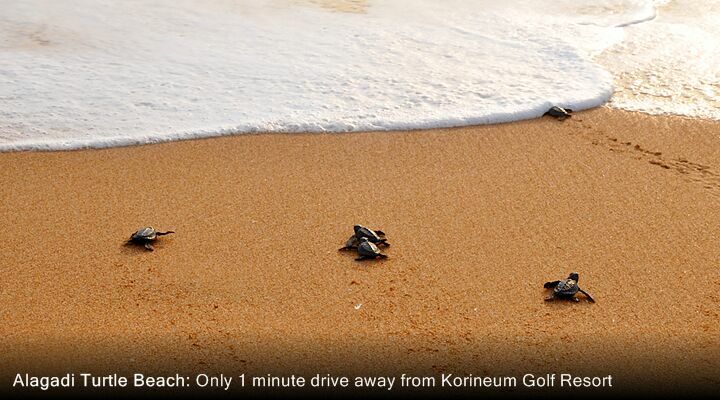 For golf fans, the course at the Korineum Golf and Beach Resort offers so much more than 18 skill-testing holes! 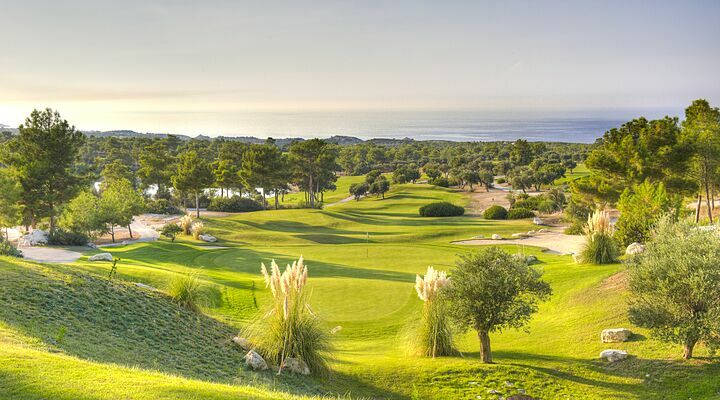 Set amongst a forest of umbrella pines, carob trees and olive trees, there is a stunning vista around every corner, and views way beyond the fairways to the sea beyond and the mountains behind. It's a stunning setting for this dynamic 6,232 metre, 72 par course with challenging bunkers and water hazards set amongst the hilltop. Trolley hire or buggy hire is available, as is golf club hire and soft spike shoe hire, plus expert tuition from the resident golf pro to help you improve your game. 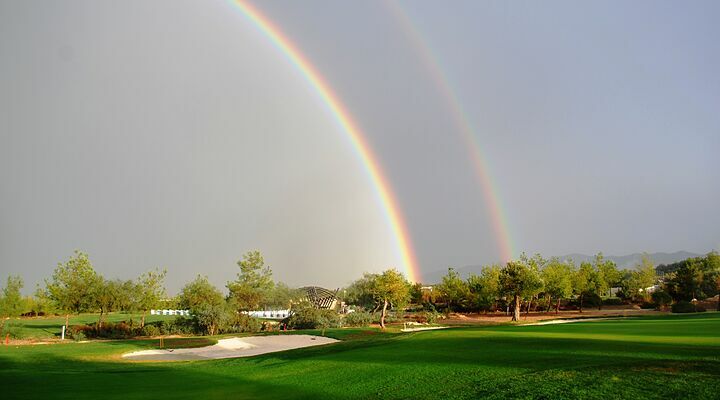 Best of all, hotel guests get a discount on all green fees, and the good value golf packages offer substantial savings on three or five rounds. 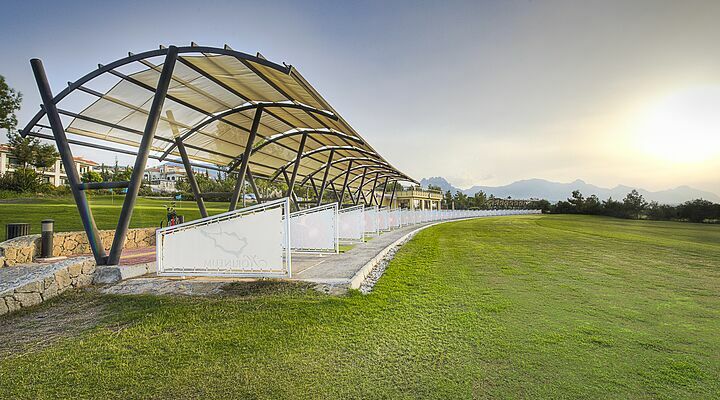 There is also a smaller Academy Golf Course and a large driving range to practice your swings. 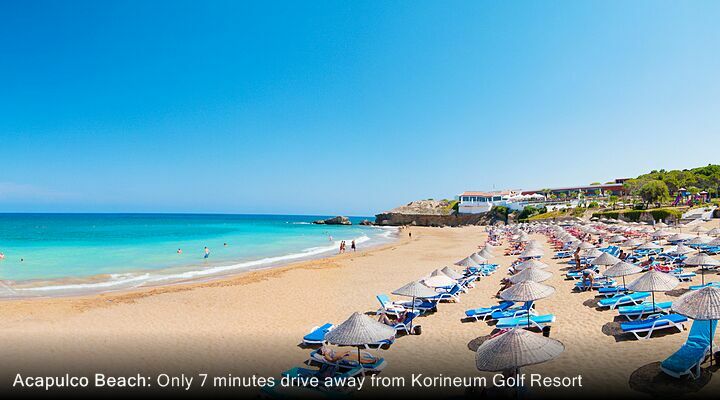 The Korineum Golf and Beach Resort really does combine the best of both worlds, with excellent onsite facilities for all the family to enjoy. The sparkling clean swimming pool has both shade and sun, so you can swim in comfort even in the hottest parts of the day, and the Sandals poolside bar is open all day for cool drinks, snacks and lunches. The kids have their own separate shallow pool to splash around in, plus a small park area with swings and slides to swoosh down. If you fancy a day by the sea, hop on the courtesy shuttle service down to the hotel's private beach, just 1.5km down the drive. 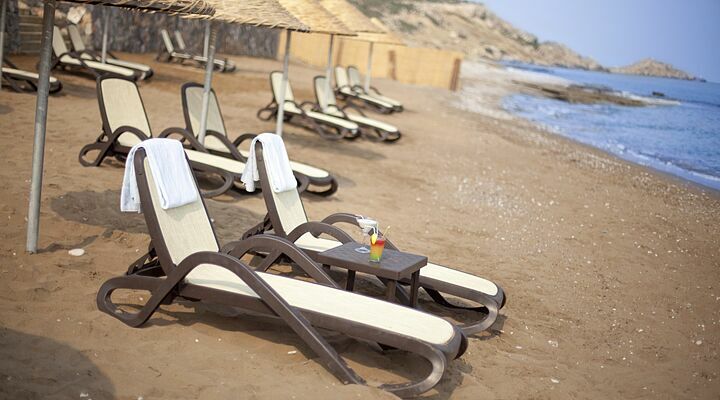 Soak up the sun on a lounger, dig your toes into the sandy beach, or swim in the sparkling Mediterranean Sea. The beach bar will keep you cool with favourite drinks, cocktails, and a great lunch menu too. 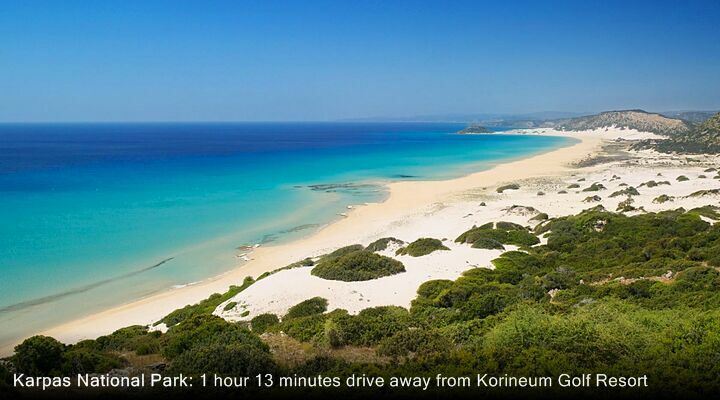 With changing cabins, toilets and outdoor showers, and a grassy area to soak up the sun, the Korineum's beach is a little gem. 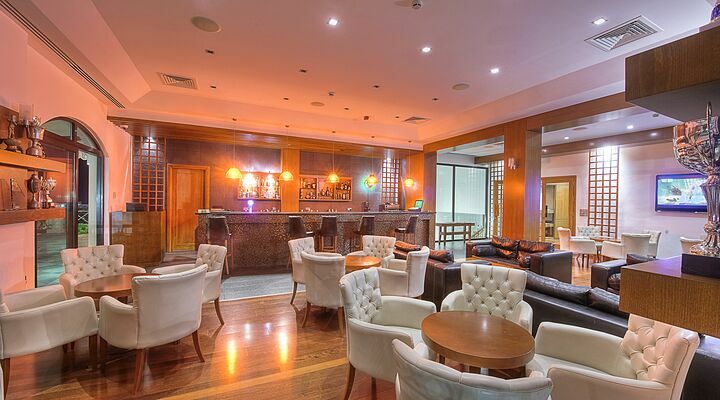 The Clubhouse at the Korieum Resort is not just for the golfers, it's the centre of activity at the hotel. 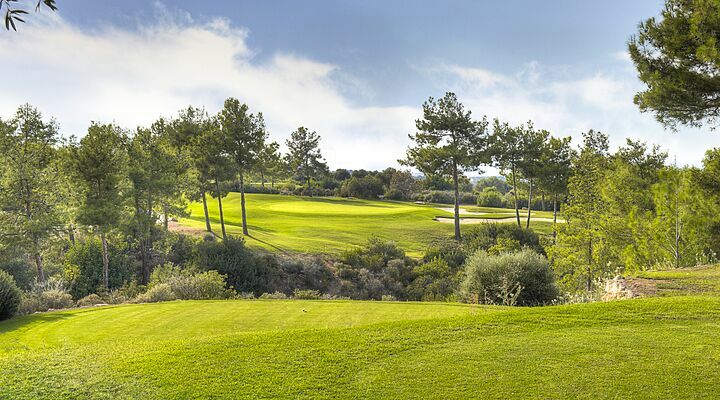 Enjoy a generous buffet breakfast, a snack lunch, and delightful dinners created using the hotel's own olives and olive oil, harvested from the golf course itself! 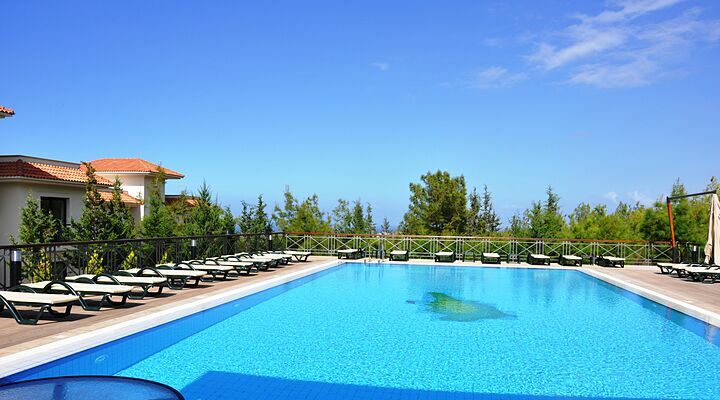 (Dishes are also prepared using fresh fruit and vegetables from the hotel garden.) 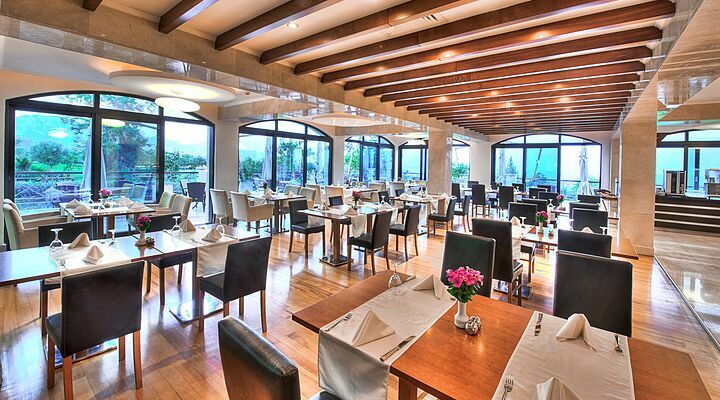 Start the day with breakfast in the Carob Island restaurant, with cooking stations for super-fresh hot food options. 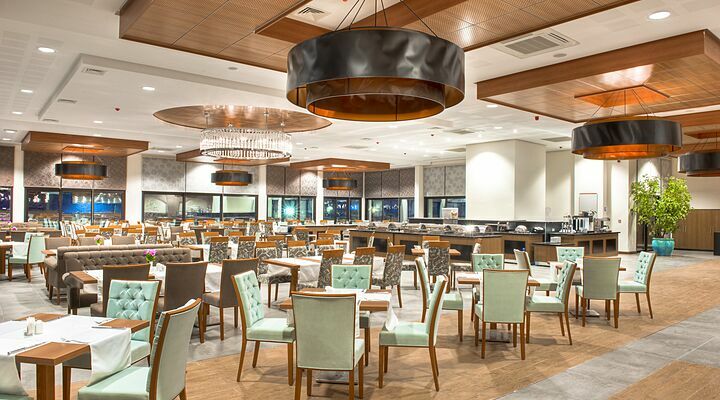 Meet friends and family for a drink in the Clubbers Lounge with its exciting fusion menu of light bites and full meals, or indulge in an à la carte lunch at the Valley Restaurant, with views down to the sparkling sea. 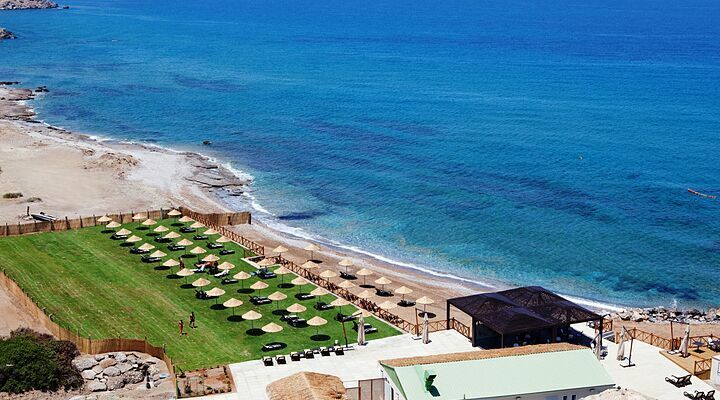 All three restaurants are open for dinner, and with special dining events including Cypriot night, Klefkito at the beach and the incredibly popular Sunday brunch (booking essential). Add in the cosy Loggerhead Sports Bar and the Academy Shanks Bar, and you really will be spoiled for choice. 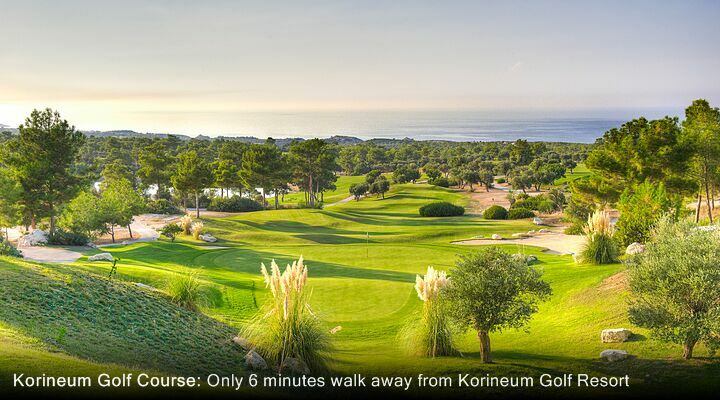 The Korineum Hotel isn't just about golf - you can improve your tennis skills here too! 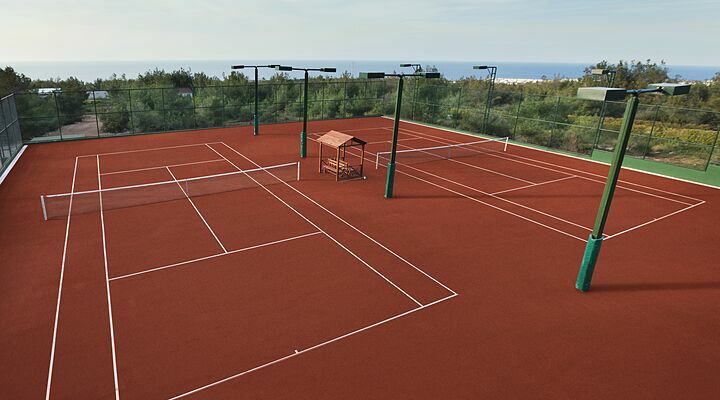 UK ex-pro Nick Grant, resident tennis coach at the Tennis Academy can help you improve your backhand, and the clay tennis courts are open to hotel guests for up to two hours every day. 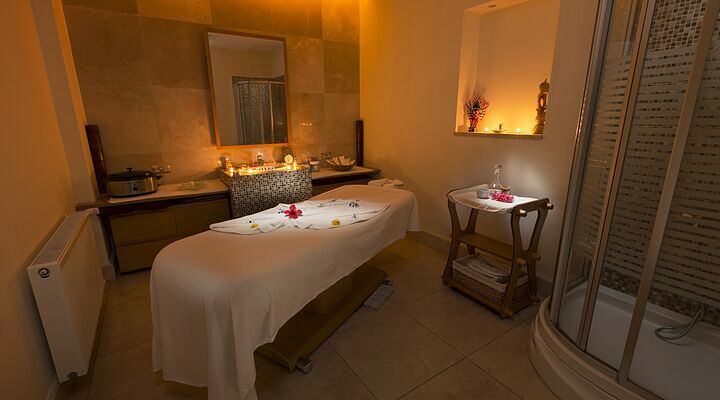 What could be more relaxing after a fabulous game of golf than a massage so soothe well exercised muscles. Actually, forget the golf and go straight for the range of treatments and massages at the hotel's spa, including Bali facials, pedicures, body scrubs, aromatherapy, stone therapy massages and (of course) sports massages. Bliss! 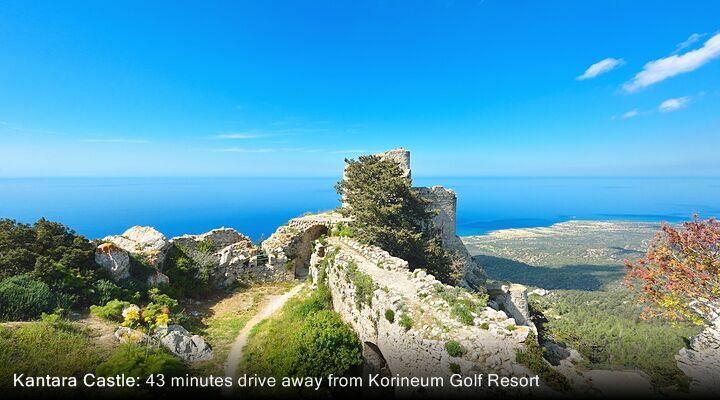 The Korinuem Golf and Beach Hotel sits above the coastline up its own private drive, enjoying peaceful location and great views. 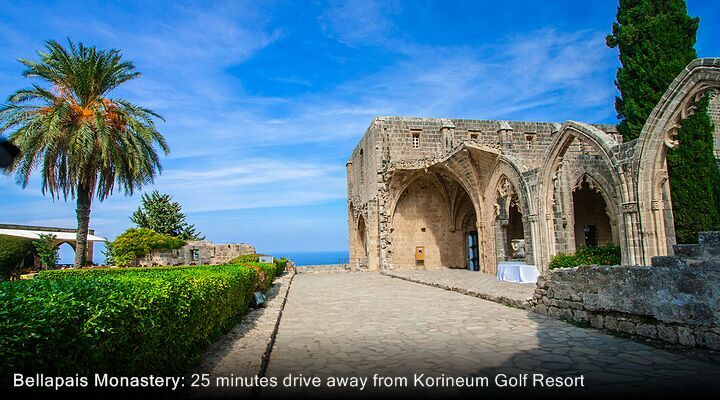 It's also ideally located for trips along the smart, smooth coast road into Kyrenia on the hotel's courtesy bus. 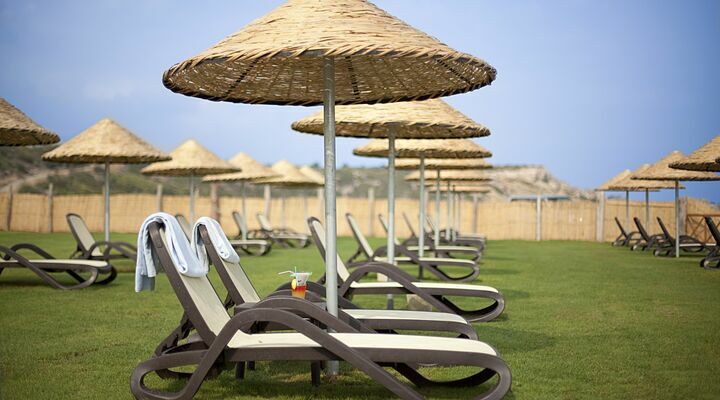 Hire a car and explore, or take a taxi ride down to nearby Aligadi Turtle Beach, where you can see turtles laying their eggs see the hatchlings dashing down to the sea during the summer months.